It turns out that there are 47 countries that might have some sort of claim on Antartica on the basis that they have south facing coastline with direct cross ocean access to the Antarctic. Unexpected results – include the surprising news (to me at least) that Somalia, Yemen and Oman could make claims – as well as Iran who (I suspect) might be tempted to set up an “Icelamic Republic” (sorry I couldn’t resist that one). (N.B: I didn’t include lots of small islands – like the French islands in the Southern Ocean, the Andaman Islands, Hawaii and the Galapagos). 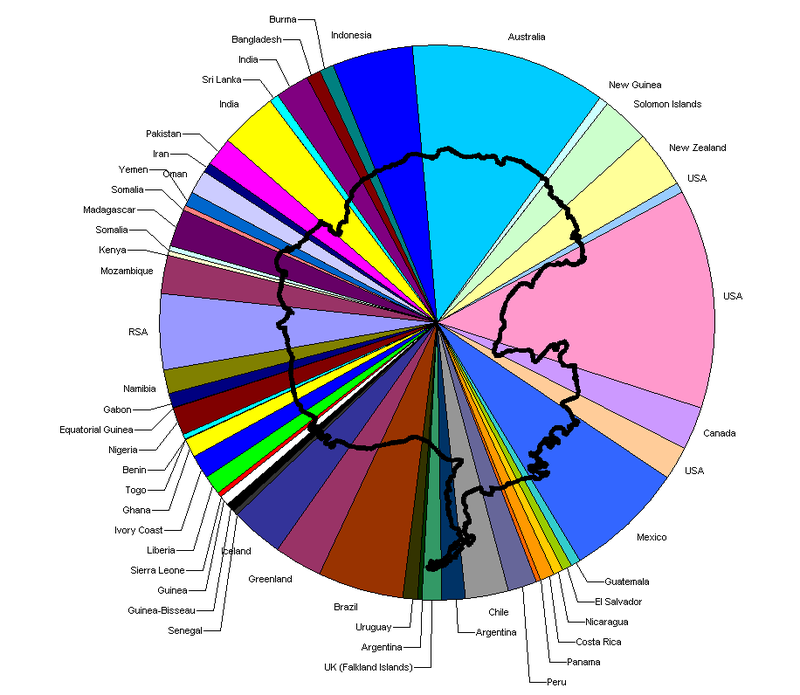 Twenty-one of the 28 Antarctic consultative nations have made no claims to Antarctic territory (although Russia and the USA have reserved the right to do so) and they do not recognise the claims of other nations. You can download the data as a Tab delimited text file which is published under a Creative Commons cc-by-sa license with an GPAC addendum (Give Peace A Chance). This means that if you do use the data I have collected you have to promise not to use it as a justification for war. This entry was posted on	November 7, 2007 at 1:16 pm	and is filed under Antarctic Maps, maps. Because he is stupid, and obviously dont even know geopgraphy. And France ? never heard about French Southern Territories, Reunion Island, French Polynesia, New Caledonia, Clipperton Island ??? all have facing coastline with direct cross ocean access to the Antarctic….but your have not forgotten Falkland islands for UK…. Yes, you are right, the chart is not perfect and France would have a small slice of Antartica. But Reunion Island (for example) is just 65km east to west. New Caledonia’s is much bigger 345km? but partly blocked by New Zealand. The Falklands are 255km east to west, and because the Falkland Islands are much closer to the Antarctic coastline they get a bigger slice.